one of a kind Electra Guitar built in effects"
I think someone is getting creative with their marketing. I don't buy that it is an Electra, except maybe a PCM electra? PCM Electras are all over the place model wise and there is no telling what you may find - some really good ones and some that are definitely not so good. If it does not say Electra, it isn't one. And I have seen that model with different names and no name on it in the late 70s time period. It was a guitar with FX built in mounted on a pickguard/plastic plate, and it was cheaply-made LP copy with a bolt neck. I'd say it is more of a gimmick than a serious instrument. It was made for the beginner. SLM Electras were more of a moderate priced instruments. They had lower cost ones, but even those were not junk. I don't think it is a SLM Electra. I remember these FX guitars around the same time as the MPC, maybe a little before or a little after. A local pawn shop had them, and they carried Cort (actually early ones were Cortez prior to being made in Korea). And I even think the Cortez were nicer. It does not mean one of the makers that supplied Electra didn't make this or these too. They all made a lot of guitars in Japan for different export to different brands. Some made some cheap instruments as well as moderate priced ones. It depended on what the customer (buying company) wanted and wanted to pay. They could make a bunch of these and silk screen Hondo or Cort on them or whatever they wanted. If no name, they could attempt to sell them without a name brand even cheaper. Some would have what appeared to be humbuckers, but inside they only had 1 actual coil of wire (common back then). They were unpotted too so they were not just noisy but squealed like crazy. Lots of really cheap guitars were made that way back then. I would not suggest wasting your money. I wouldn't pay $50 for one - and I really like funky guitars too. Thanks Thorny. I knew I had seen a picture of one like that before. I hadn't noticed that there is no name on the headstock. I didn't consider buying it. In fact I will be downsizing soon. I live on a small sailboat with four Electras and one Aria Pro II Knight Warrior. I will be selling one of my two x290 Workingman guitars and the Aria. That will leave me with a Workingman, an Invicta and a 2245 Super Rock. If I were to buy another brand vintage Japanese guitar, it would be something I know has a good reputation, Greco, Ibanez, Aria Pro II, etc. Or possibly a Westbury like the Standard - the ones that look similar to a Workingman, with set neck. On the other hand, I've been playing a borrowed Squire Strat, and enjoyed it. There may be a Strat in my future. I just need a bigger boat. I just got one fairly recently, but I am at nearly 40 guitars so let me know if you you are interested. It is a fantastic guitar. I have no complaints except too many right now. Other choices are all good. As far as strats, I had a squier classic vibe which is probably the best for the money as they have good bones - quality necks, good pickups, good body (alder). I upgraded the electronics and put texas specials in (although I have to say the stock classic vibe pickups are essentially tone riders, and excellent quality). I upgraded it with with a GFS steel tone block and got a better bar (the stock one would flex too much). Lots of setup work. Then I got an itch for a V neck. Fender ones are too expensive and I wanted rosewood too. So I found a new mighty might V neck with a rosewood board. I finished off a lot of sharp fret ends, and put on fender locking tuners, and neck plate. Now is a partocaster, but a really nice one. I am picky about wood and wanted an alder body. I am not saying non-alder is not good, just a little unpredictable. The classic vibe body is fine. Sold the old neck and paid for the parts. I have more of what I want. The only thing I don't have is a matching headstock - that would be even better! But I don't spray guitars. That's what is cool about fenders, don't like something - even a neck - you can change it. Man, I got off subject again so I had better stop. Yeah, like that Westbury. Very nice. Like a set neck Workingman. How is it different from a Workingman? For example, the sound with original pickups, and how the neck feels. I imagine the workmanship is similar quality. I like the necks on my Workingman and Invicta. At first, the neck on my Super Rock felt uncomfortable to me, being thicker, but I have gotten used to it. The borrowed Squire Strat neck felt to thin, but after playing it a lot this week, I like it. It seems thinner than American or Mexican Strats, that I have tried out at Guitar Center and Sam Ashe. I never noticed them feeling too thin. I think the Squire I borrowed is a lower end one - Affinity or Bullet. Sounds like a Strat and stays in tune pretty good though. Neck is a bit different shape. It feels wide but in a good way. The stock dimarzio is more mids in the bridge and a little cleaner in the neck. It is a very nice professional grade instrument. If you like a working man you will like the Westbury. If you had the same dimarzio on your electra you’d be closer but the feel is a bit different. Some working man guitars are heavy to so may be a little weight difference but there can be a good degree of variance there guitar by guitar. You’d like it. I see lots of claims about original rare Electra's and Hondo's. I called a guy out once claiming a Hondo flying V was a rare Gibson.he changed the ad. Strong Vantage vibe with that Westbury Standard, eh?! Quality! The Westone admin back then was something of a firebrand and after contacting the hot-listing seller, if the ad wasn't modified, or the seller was recalcitrant, he'd change the hot link to something quite objectionable! 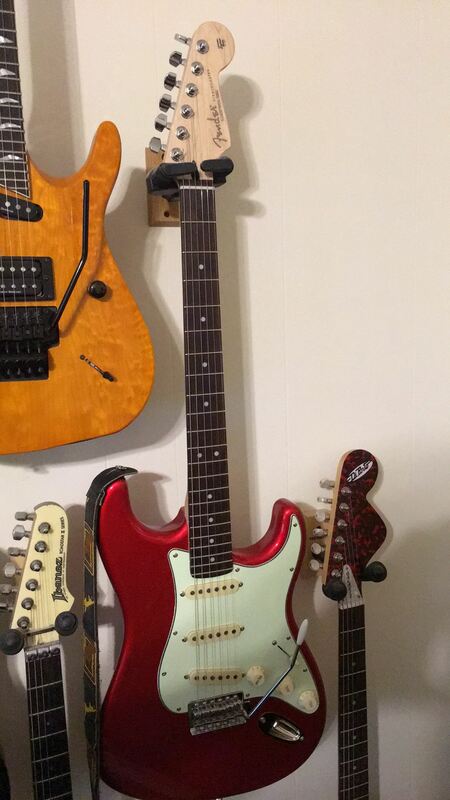 The guitar in the ebay auction is a Kay Effector, I remember them being sold by Sears. Korean made, which meant nothing good in that era. Plenty of references and photos around the 'net about this model. ultra sonic solved the mystery. I typed it into a Google search and came up with lots of links about the Effector. Also saw something about a Telecaster Effector.